Doc is always dragging me along to different events hoping that she will instill some culture into my being. This time she took me to the symphony. Being a dog I had no clue what I was about to experience but decided to remain open to a new adventure because that’s how I roll. I have to say, I was pleasantly surprised. 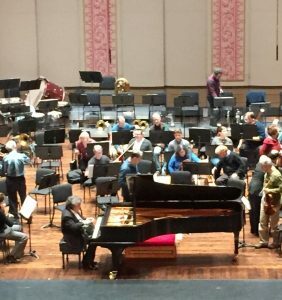 We were joined by some other human friends Joe and Kevin at the 10am dress rehearsal of the Russian Winter Festival featuring Tchaikovsky’s Piano Concerto. Why did we go to a dress rehearsal you may ask? For two reason’s; It only cost $10 and you know how cheap Doc is and because we get up so darn early we can’t stay awake for the 8pm performance. Oh did I mention that Doc is cheap? Since it was general admission we went upstairs and sat in the most expensive seats in the house, the Loge. Waiting for the concert to begin I enjoyed listening to all the orchestra members tune up and practice their instruments. It is the most wonderful cacophony of sounds. Soon the conductor entered, tapped his baton on the podium to get their attention and off they went. After stopping them a few times to correct errors I never heard, they resumed playing and it was beautiful. I especially liked the violin section. But my favorite part of the whole show was when the featured pianist Sergei Babayan came out to join the symphony. He walked out, sat down on the piano bench and played Tchaikovsky’s piano concerto like he meant business. Bravo!!! And may I add that he also had an impressive head of hair. Often I hear Doc encourage her patients to try new things now that they are in recovery. It can feel unsettling to go outside your comfort zone, but there are many rewards in experiencing something new. For myself, I am glad I went. I have expanded my horizons and am not too proud to say I can’t wait until we go again. You know what they say ” Music soothes the savage beast.” Count this beast as one that has been soothed.